Going Beyond Pain for an Everlasting Gold • Crisis, what crisis? - La crise, quelle crise ?Crisis, what crisis? – La crise, quelle crise ? Day 536. Shun Fujimoto. For most people, this name is unknown. In 1976 were held the Montreal Olympics. During those, the little prodigy Nadia Comăneci, got the first ever perfect 10 at the uneven bars (that was displayed 1.00 because the scoreboard had only 3 digits, as nobody ever expected a 10.00), but one of the other striking events was the gold medal of the Japanese gymnastic team, winning ahead of the dominant Russian team. 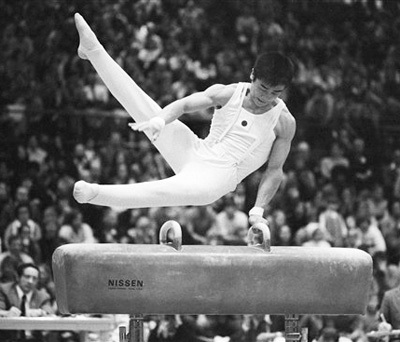 Victory was given to the Japanese by one man: Shun Fujimoto, getting a good 9.5 on the pommel horse and 9.7 on the rings. However, Shun participated in both events, with a broken knee cap! He broke is knee during the floor exercise, but did not want to let his team down. He therefore participated in the pommel horse and rings, which did not require standing station, but at the end of the exercise. If you ever broke a bone in your body, you know how this hurts (although endorphins generated by the physical exercise will sooth the pain temporarily). Shun participated, going over this pain, and the Japanese team won the everlasting Olympics gold medal. Temporary pain was less important than the everlasting pride to have won an Olympics gold medal. Every time I face a hurdle in my life, I keep coming back to this athlete in Montreal (an easy memory for me as I was in Montreal at that time and had the chance to witness the French gold medal of Guy Drut on the 110m hurdles, but that’s another story). I do not know if I would have been capable to do what Shun did. It’s an example of what the brain can help you achieve when you value long term over short term. Are you ready?